I read the book, Fallen, by Lauren Kate earlier this year and enjoyed it. 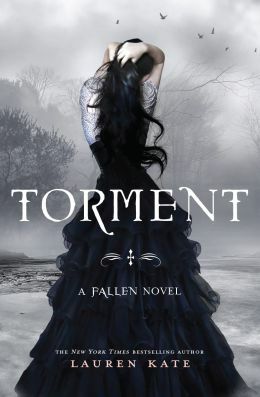 So when the second book in her Fallen Series, Torment, came out, I went out and bought it that very week. And then it just sat on my bookshelf for the past few months while I worked on writing projects and read other books. I don't know why I hesitated to start this one for as long as I did. Maybe it was because the first book left me feeling slightly baffled. Don't get me wrong, I liked it, but it still left me with the feeling that I was missing some vital plot line. Torment is no different. I spent the entire time feeling confused because I thought I had missed out on something obvious. This book really doesn't answer a lot of questions that people might have had from the first book. All that said though, once I started reading it I couldn't put it down. I literally read the book in two days. The storyline is creative and the author puts in some nice elements such as the Announcers (if you've read the book, you know what those are). The overall plot is fascinating, but then I love stories about fallen angels. I'd recommend this series, though you may want to rent Fallen from the library first to see if it's your kind of book. When the third book in the series, Passion, comes out next summer, I know I'll go out and buy it. For details on the books you can visit the Fallen Books Website.